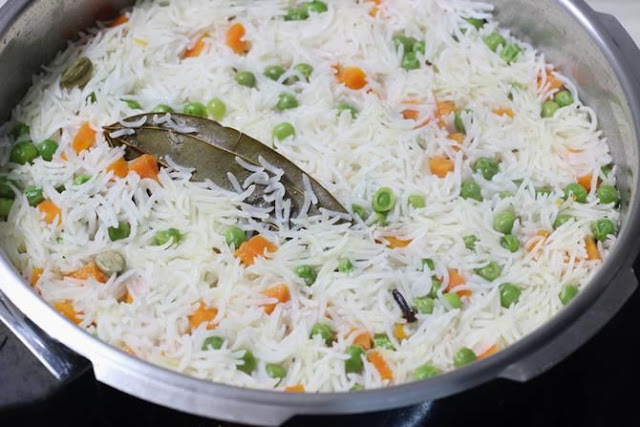 Coconut milk rice is a popular aromatic and delicious dish. You can try making this amazing Coconut milk rice in your kitchen. This recipe requires 10 min for preparation and 15 min to cook. The Coconut milk rice by parveen has detailed steps with pictures so you can easily learn how to cook Coconut milk rice at home without any difficulty. Coconut milk rice is enjoyed by everyone and can be served on special occasions. The flavours of the Coconut milk rice would satiate your taste buds. You must try making Coconut milk rice this weekend. Share your Coconut milk rice cooking experience on the indianhealthyrecipe platform. You can also use the “What’s cooking” feature on the app to get in touch with other home chefs like parveen for inputs. In case you have any queries for Coconut milk rice you can comment on the recipe page to connect with the parveen. You can also rate the Coconut milk rice and give feedback. Wash and soak rice for at least 10 to 15 minutes. Keep aside one to 2 tbsp. Of scraped coconut. Blend chopped coconut pieces with 1 cup water. Filter to extract the milk and Mix with the rest of the water. i.e. 1 ½ cup water. Store bought milk can also be used. Add ghee to a pan or pot, fry the grated coconut till it turns slightly brown. Add cashews and fry. Set these aside. This step is optional. Cook till the rice is fully cooked. Cover and cook on a medium flame. Little water can be sprinkled if rice is still not cooked well. Garnish coconut milk rice with roasted coconut and cashews.